Given the severity of the Great Recession and the lackluster recovery to date, we have seen a larger share of workers working part-time, more underemployment, lower labor force participation rates and higher numbers of discouraged, or marginally attached, workers. This is one reason a lot of people focus on the so-called U-6 unemployment rate since it includes those who have recently given up looking for work and those working part-time for economic reasons. Next week I will have a three part series on unemployment and the labor market, but for now I wanted to highlight some recent work on underemployment and share Oregon specific numbers. One of the consequences of a broken job ladder is that workers take—and stick around in—less than ideal jobs like fast food. But the failure of the job ladder does not impact all workers equally. Higher-credentialed workers have more opportunities to get some job—any job—than their lower-credentialed counterparts. A college graduate can get a job at McDonald’s if she wants to, but a high school grad will have a hard time getting a job in finance. So as the labor market is stuck in a low gear, an increasing share of fast food vacancies are filled with people who may not have taken such jobs in a healthy labor market, or may have climbed up the job ladder to better opportunities. This is a form of skills-mismatch, but one that is induced by demand conditions. Professor Dube’s good idea contribution is to look at not just the educational attainment of the overall population or within sectors, but to focus on the educational attainment of the recently hired workers. I have dug into the same data, but for Oregon and find a similar pattern. 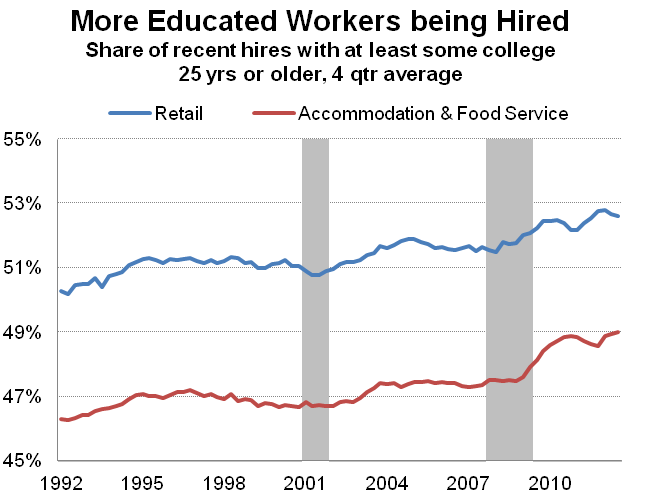 For recently hired workers in both retail and accommodation and food services, the share with at least some college has risen since the Great Recession. While an overall rising educational attainment level for the country and Oregon will likely be seen in hiring patterns — and it is — these big movements in industries that generally do not require post-secondary education largely reflect a poor labor market. UPDATE: the title of the graph has been updated to better reflect what is actually being presented. The previous title was “Hires with Some College are Up” when the graph actually presents the share of recent hires with at least some college but also those with bachelor’s and graduate degrees. If you dive even deeper into the data you see these same trends in the sub-sectors such as home improvement stores, grocery stores, gas stations and also accommodations and food services individually. Now for a few caveats. In the data there are five educational attainment categories: less than high school, high school, some college, bachelor’s and higher, and not identified. What you see above is some college plus bachelor’s as a share of the sum of the four categories that are identified. The not identified are excluded from these calculations but whether or not you include them does not change the general story, particularly for the industries shown above. It should also be pointed out that some industries are showing a declining share of hires with some college, and these declines are generally in the highest educational attainment industries overall such as health care, finance, professional and technical services, etc. These trends are longer running and not directly tied to the timing of the Great Recession. It would be interesting to find out the reasons why. It may have to do with job polarization even within these industries, but that is unknown at this time and, again, these industries do have above average educational attainment levels overall. Finally, it has been brought to my attention by our good friends over at the Employment Department, that this LEHD data that the Census puts together, while generally good, has some sparse documentation on how they attach Census and ACS data for educational attainment and ethnicity data to the employment data. This can cause some technical issues with these numbers but I’m not going to let potentially bad data get in the way of good theory here. 🙂 So take these figures with a grain of salt but they still are the best data I’ve seen to match up with the anecdotal stories we have heard in recent years. There is some level of misinformation in the graph above, many people take a few college classes but nothing relevant to a specific career choice, mostly exploratory to see if they like the college scene. Some get a six month / 1 year certificate. The reality if that of all people with some college education including any of the degrees, 45% never completed a degree. It is like someone with some education but no High School diploma or GED. They are not considered as prepared for work as the person with a high School Diploma or GED. So that begs the question as to how truly under employed are they. There are no current statistics on how many of these 45% actually have certificates and in which fields. A better representation then of underemployment would be folks with an actual degree. But then we must also ask if a worker 50+ years old with at least 25 years work experience that works in retail or fast food is also not underemployed even if they have no college degree? And what about people with training in trades or technical fields not counted as “college” education? There are no simple metrics, and probably I am making a stronger case for more people being underemployed than what the graph above shows. The point is, that if we are going to measure underemployment, we should do it right. Thanks Malcolm. You’re right that there is no simple metric and certainly not one single metric that would show everything. The graph and research process presented here was just one, new to me at least, way to show the increase in underemployment in recent years. The same pattern is there if you filter it to just college degrees instead of some college plus college degrees. The story does not change in that regard (just the specific percentages). Good point! Considering that in retail and fast food only about 5 -10 % (mostly management, specialty sales, IT support, etc.) of the occupations require a college degree of some sort, there definitely is a higher number of degreed workers than needed employed in those industries. to research this. I am sure there is similar data for Oregon, but I could not get at it easily. I guess my point was the degree of the situation based on educational attainment alone, is the system in need of a doctors visit or do we need to rush it to the hospital in an ambulance? Having lived in Latin America several years, and traveled to other parts of the world where, as an example, most taxi drivers have more education than I do, adds some perspective to the situation in the US. All good points. One interesting thing with the projections data is it has typical education required to get a certain job. In 2012 they estimate that 32.5 million jobs need at least a Bachelor’s, but across the U.S. we employed 46.3 million individuals with at least a Bachelor’s. Does that mean those 13.8 million individuals are underemployed? Maybe, maybe not. Educational attainment isn’t be all and end all, but it is one easy way to slice the data to analyze things. Lots of good, smart, productive workers with not degree and lots of less productive workers that do have a degree, etc. One item we try to highlight a lot is that many of the good-paying, middle-wage jobs are in trades like construction and installation, mainentance and repair, which usually have no formal education requirements but do require on the job training or an apprenticeship, but at the end of the day you will be making just as much as the typical arts/design/entertainment, or education or community service worker, most of which do require a 4 year degree or more.